My dad got me interested in tools as a kid. He was pretty handy with machines and tools, and was focused enough to do pretty good work. He spent time in Europe in the late fifties with the Army ASA, he was smart. He told short, cleaned-up stories about German cars and German beer. He had pictures of the nights he spent in Munich. Some times cars in the photos were upside down being pulled from sidewalks or ditches. He was a little wild too. When I was in sixth grade I came home with homework that included studies in the metric system. Dad lit up. With-in an hour or so I had the metric measurement system figured out. I also got a solid lecture on political nonsense in our country that refused to adopt the measurement system spreading across the globe. He explained the frustration mechanics lived with having to buy a second set of tools for European and Japanese cars. He shook his head and blinked his eyes sympathizing with science and industry trying to build alliances across confusing lines of measurement. I got more than I asked for that day. It stuck. I’m going with metric. It’s way easier than fractions, miles, yards, pints, sixteenths and all that. I’m sticking with one through ten and the efficiency of moving a simple decimal point. I set my smart phone, navigation devises and everything else I can to the metric system. This is great when driving or taking a road trip. I love that I can set my wife’s kitchen scale to metric. I picked five hundred and twenty-three grams of berries one day last summer. I use the metric side of the blender. I know my body weight in kilograms. When I listen to radio shows about science and industry I know what the scientist is talking about before the host asks them to re-explain in miles and pounds-I wish they’d stop that. It’s all pretty great. It’s easy to understand and is all over the world. Almost. Fractions are still out there, in the schools, in lumber yards and on grade cards. My kids were failing fractions in grade school. The teacher brought this to our attention in a conference. I told her I couldn’t understand why she was still teaching fractions anyway. I was ready to focus on something else. Recently fractions have taken a turn for the worst. 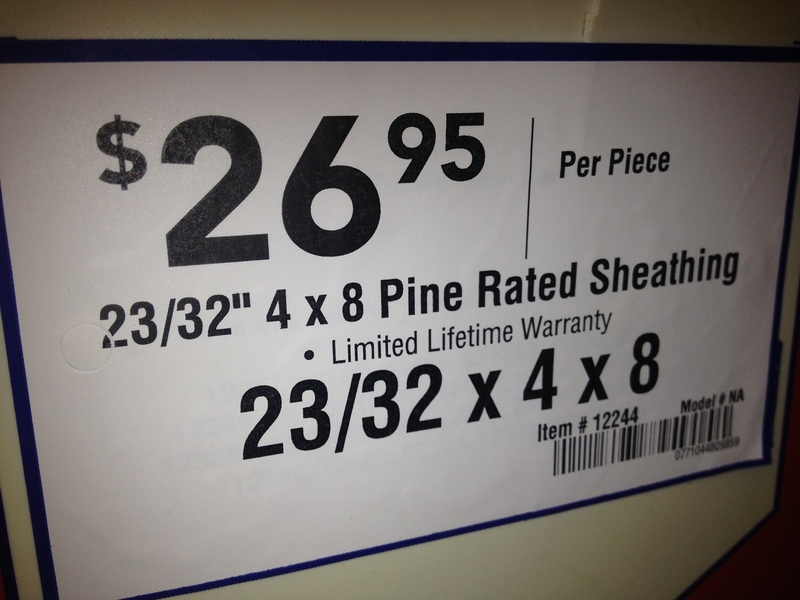 In the biggest box stores in America fractions are at the forefront of ridiculousness. Try to buy some plywood this week. You’ll be looking for quarter inch, three-eighths, half, five-eighths or three-quarter. Good luck. You’ll be looking at signs that say things like thirty-eight-sixty-fourth, or twenty-three-twenty fourths or even seventeen-thirty seconds. You’ll be standing in the isle trying to figure out what you’re reading. Ask an associate for help. Unless they work in that isle they won’t have a clue what the fractions are saying. Here’s more, five feet away will be a half dozen immigrant workers trying to buy materials. In their developing countries they have grown up with little fresh water, poor infrastructure and may not know how to read very well. English may be the biggest learning curve they have standing in that store. But they know the metric system. They’re looking at signs printed in the freest country in the world that won’t give up the ancient measurement system of it’s mother country. You see science and industry are out there manufacturing plywood and lumber. Since plywood is now manufactured to metric standards you might be looking for something thirteen millimeters thick, or eight millimeters thick. But once it get’s into the hands of retail America it is displayed with the exact measurement of it’s thickness-but in fractions. Retail America does not trust us to use metrics. Prove them wrong. Act like a scientist. Pretend you believe other countries are great places to do business. Dream of having a conversation with a college kid riding a bike in Sweden. Plan a trip on the Eurail. Next time in you’re vacationing Mexico ask how far away something is, then, resist the urge to ask them to repeat that in miles. Get on the metric bandwagon. Set everything you can to the metric system. Like your bathroom scales. Your friends won’t have any idea how much you weigh, even if you tell them-but the nurse at the doctor’s office will. Set your navigation devises to kilometers instead of miles. You’ll be amazed at how fast you’ll get used to it. It will drive your teenage kids nuts, until the foreign exchange students sets them straight. Figure it out in the kitchen. You’ll be impressed by the simplicity. It will be like planning a trip out of country. Sort of a new language, but easy. You’re not using the queen’s english, give up the yard stick. Lumber’s going to be tricky. Houses are still being built on sixteen inch centers and ninety-six inch ceiling heights. In the future we’ll know those lengths in meters and centimeters. Houses will start being built the same. Until then I’ll carry a tape into the box store with me. I’ve got some plywood thicknesses to figure out.